The twin-island nation of Trinidad and Tobago has some great beaches, including some charming strands popular with day-trippers from the capital Port of Spain and the quiet Tobago getaway spots where Trini natives flock for their own holiday getaways. The half-moon-shaped Maracas Bay is home to a tranquil, well-maintained beach, protected by a line of palm trees. This is a popular spot for getaways from Port of Spain—just consider the hour-long drive over the mountains as part of the fun. Many revelers head here to sleep off the annual Carnival celebration, and it's always great to take part in another local tradition available from the local beach shacks—Bake and Shark—a Trinidadian dish of deep-fried shark stuffed in a pocket of deep-fried bread. Keep driving past Maracas Bay on the north coast to find Las Cuevas (The Caves) which has gentle surf, a snack bar, picnic tables, changing rooms, and showers, as well as lifeguards on duty each day. Also, in line with its name, there are a fair number of small caves great for exploring and avoiding the harsh sunlight if sunbathing isn't your thing. A little over an hour away from Port of Spain, up the north coast, Blanchisseuse is a favorite place for travelers to go on a weekend getaway, or for a long day trip. With pristine waters, amazing hiking trails through the rainforest, and prime wildlife-watching for leatherback sea-turtles, this beach offers far more than a tan and quick dip. On the southeast coast of the island, Mayaro Beach is the longest stretch of beach on the island. Locals love this area, and fishermen often come to shore with the fresh catch of the day. However, this beach can get a bit dirtier than others, so make sure to check the beach conditions before you make your way over. Protected by the Buccoo Reef, Pigeon Point Beach is ideal for families and children. Set on a private coconut estate, the beach is lined with coconut palms, palapas, and a great beach bar/restaurant just steps from the cerulean sea. Pigeon Point's claim to fame is a thatched-roof jetty that has come to be an informal logo of Tobago. Water-sports and souvenir shops to keep everyone entertained. 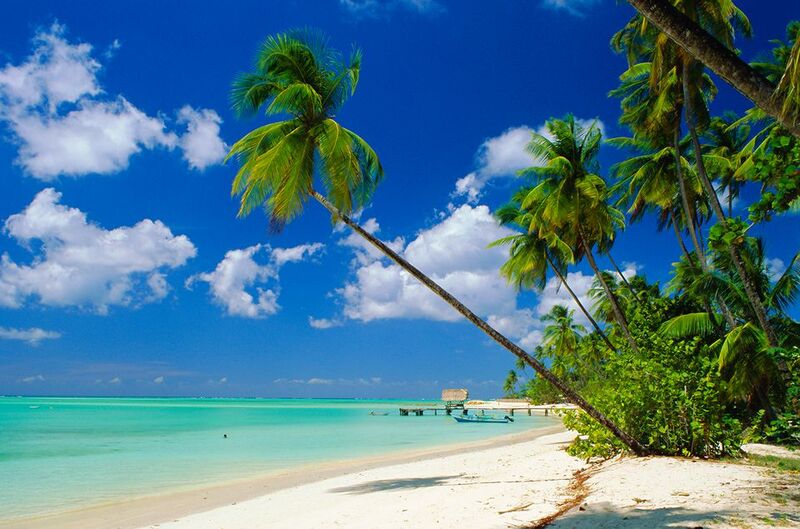 This west coast beach on Tobago is part of a small, friendly fishing village. The area is charming and quiet, with calm waters and beautiful sunsets. It's a great destination for those who don't need much more than sunshine and a cool breeze to keep them happy. Secluded and relaxing, Englishman’s Bay has a mile-long U-shaped beach edged by a freshwater stream flowing from the Tobago rainforest. Just offshore, brilliant coral reefs ripple with tropical fish. Though not as heavily populated as other western Tobago beaches, Englishman's is considered one of the island's most beautiful oceanfront destinations. For visitors' convenience, there are men's and women's bathrooms, as well as a small restaurant, Eula's, on the bay's shore.